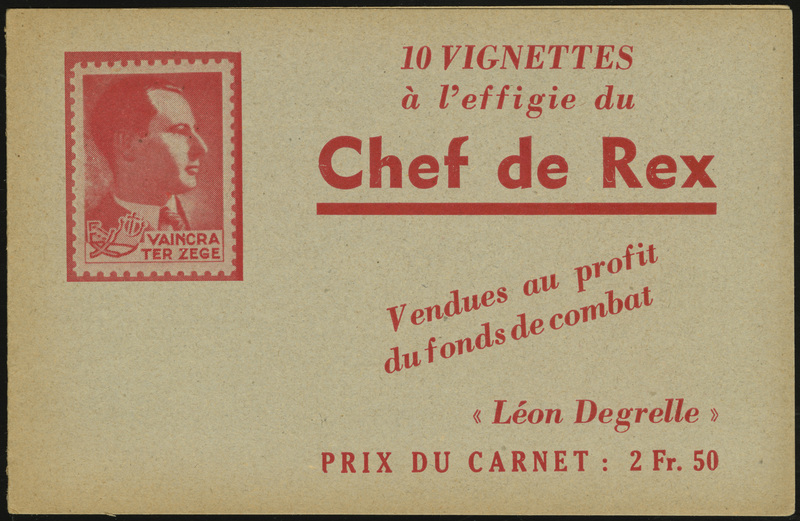 In 1930, Léon Degrelle founded the Rexist Party in Belgium. Rexism called for a reformation of Belgian society in conformity with the teachings of the Catholic Church, but in a fascist form of government. In 1935-36, the Catholic Church cut ties with the Rexists over their increasingly close ties with Hitler and Mussolini. The Rexists began receiving monetary support from Germany and Italy, to the tune of approximately 2 million lire and 100,000 marks in 1936 alone. In the 1936 elections, the Rexists reached the peak of their power, claiming 21 deputies and 12 senators in the Belgian elections. 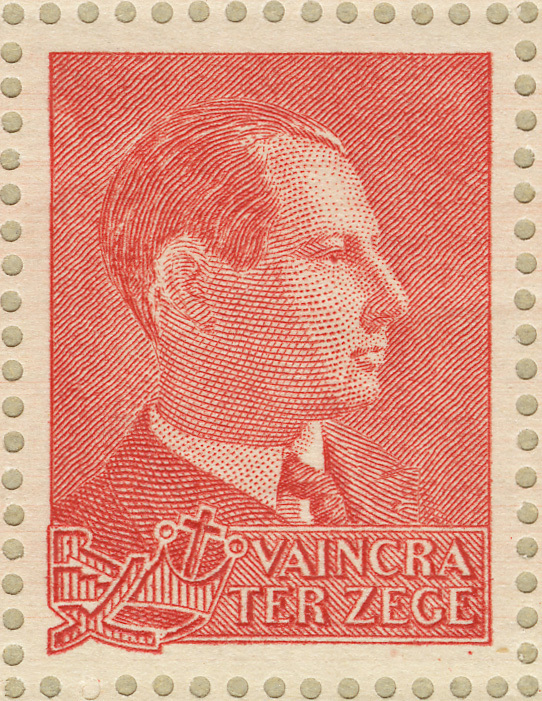 To raise funds for the election, the Rexists published this stamp featuring Degrelle. 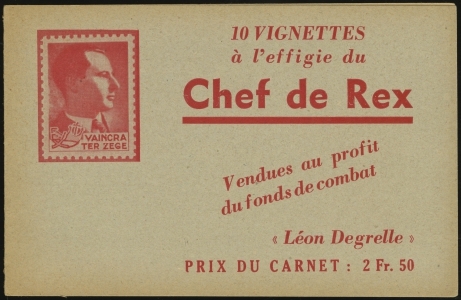 It was sold in booklets of 10. 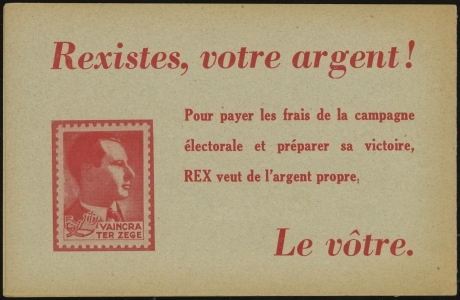 With the violation of Belgian neutrality by the Nazis on 10 May 1940, the Rexist Party split over the matter of resistance. Many Rexists went underground and began resisting the German occupation. Others, most notably Degrelle, sided with the Germans. Degrelle was arrested for collaborating with the Germans and was evacuated to France, where he was eventually released by the Germans. Upon his release, he returned to Belgium and joined the Walloon Legion. Degrelle would eventually rise to the rank of SS-Obersturmbannführer (Lieutenant Colonel), and become one of only two foreigners to be awarded the Knight’s Cross with Oak Leaves. At the end of the war, Degrelle fled to Denmark and Norway, where he then commandeered a Heinkel He 111 aircraft and fled to Spain. Franco’s government refused to turn over Degrelle for extradition, even going so far as to allow him to escape from the hospital where he was staying while handing over a look-alike. In 1954, Spain granted him Spanish citizenship under the name José León Ramírez Reina. Belgium convicted him of treason in absentia and condemned him to death by firing squad. Degrelle would remain in Spain until his death in 1994.